Last night was a dream to remember. I went around the world, eating blues – well, figuratively, at Tria’s Fermentation School. 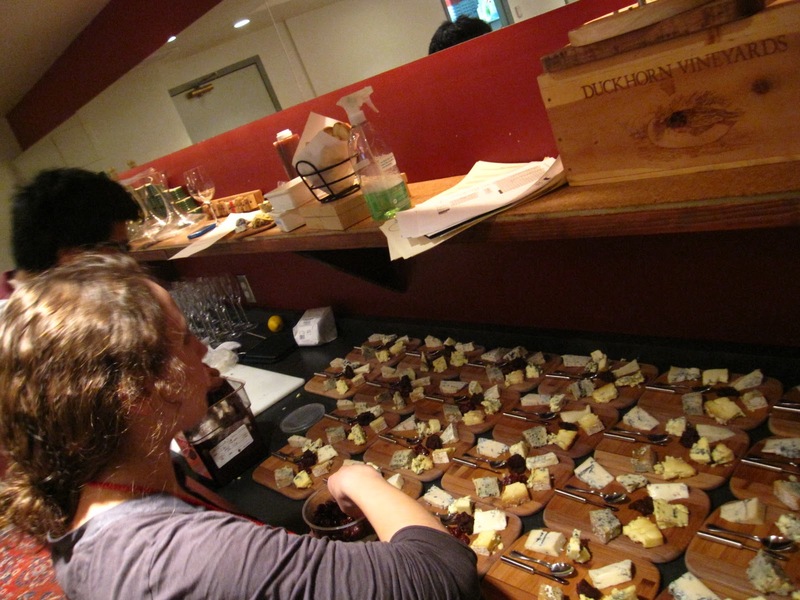 When Tria Wine Director Michael McCauley invited me to teach a class there, I never imagined he’d fall for my trick: a chance to effervesce about blue cheese. One reason I’m wild about this style of cheese is that so many cultures have developed iconic blues. Italians exude Gorgonzola. 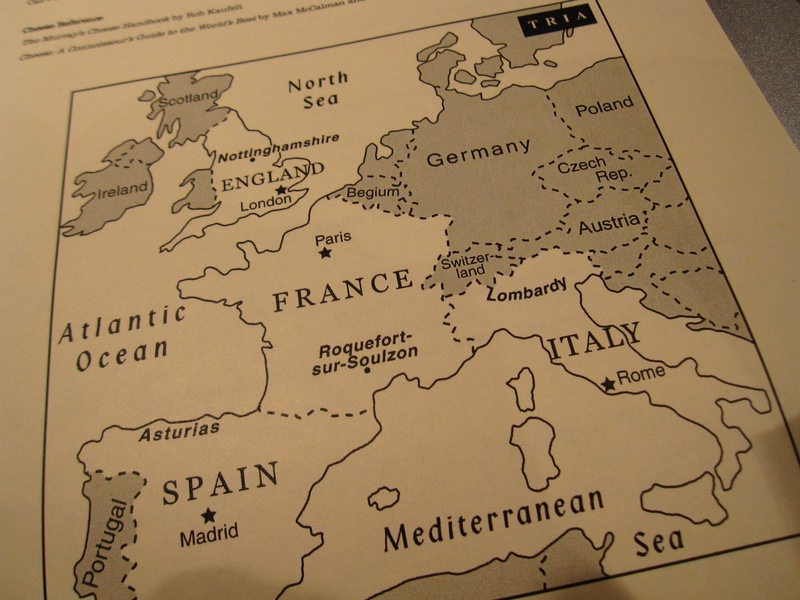 The French can think only of Roquefort. In Spain, you find Valdeon and firey Cabrales, while the Brits pick at nubby crumbs of Stilton. Even in Ireland, you find creamy Cashel. And let’s not forget the Danes with their Saga or the U.S. with its Iowa flower, Maytag. 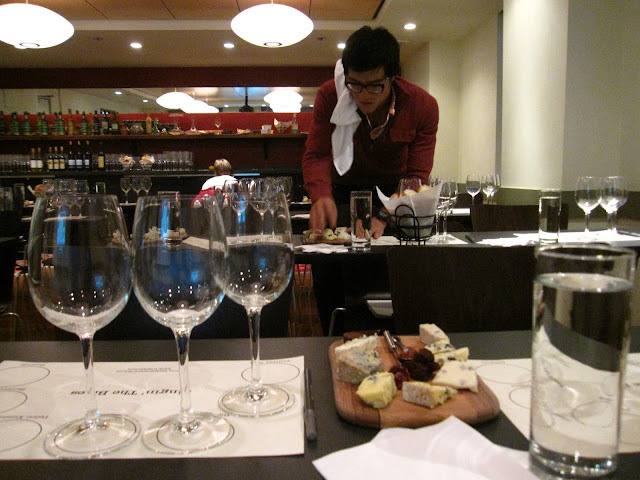 At Tria, the fantastic staff helped me pick perfect pairings for 7 wedges of blue. And off we went, around the world on our blue cheese expedition, from mild and milky to ultra-rich and ferocious, with sides of Allagash-steeped cherries and chocolate-fig jam. Here's the recap. A gorgeous goat blue from Lombardy, served with brilliant sparkly. Like an exotic cigarette and a cherry kiss, all at once. Fantastic. A lazy blue with a rambunctious red – the wine was liquid chocolate. Two glorious beasts from the stilton world -- one pasteurized, the other raw – served with not-too-sweet barleywine. This wicked, sinus-clearing blue was beautifully tamed by a drop of PX. Salty sheep’s milk meets gorgeous straw-colored Sauternes. It's like a perfect personal ad. Local fudge kissed with Sue Millers salty blue, served with a spectacular port-like creature. Many thanks to the great folks at Tria for providing a venue like this in Philadelphia. The Fermentation School is used for staff trainings throughout the week (Tria has 3 wine bars that serve an eclectic, ever-changing selection of cheeses, wine, beer, and meals), and tastings for the public are held several times per month. Their event calendar is a must-bookmark site and is especially useful for keeping track of happy hour and their ever-popular Sunday School program (a special offering of beer, wine, and cheese -- at a very low price, only on Sundays). Sometimes, a cheese makes its way into my handbag simply because its name is irresistible. So it was with Mrs. Kirkham’s Tasty Lancashire, a mellow raw-milk cheese with a wistful cheddary nature. When I sampled it at the cheese counter, I thought to myself “meh.” But Zeke the Cheesemonger was so giddy about it, and I had such a bad case of Indecision that I bought half a pound simply because it appealed to my bookish nature. Mrs. Kirkham’s Tasty Lancashire – it sounded very much like the sort of cheese one might eat while reading Bronte on a gloomy afternoon. Two days later, I found myself hosting a harvest soiree, complete with a goat-horn drinking carafe. What luck to have some Mrs. Kirkham’s TL on hand, along with a spot of chutney. It proved to be the hit of the party. We marveled not just at the taste – which was very delicate, milky and lemony – but also at the texture. The curds of Mrs. Kirkham’s Tasty Lancashire are ground up like sausage. The result is a moist, nearly fluffy cheese that breaks apart like individual snow flakes on your tongue. “The texture is extraordinary,” commented the Blue Cheese Brit, who has a penchant for aggressive cheddars. Despite his former carefree life in London, the Brit was new to Mrs. Kirkham’s Tasty Lancashire. Curious. I scoured my cheese library for a bit of history. Wouldn’t you know that Max McCalman had the skinny? Lancashire is an age-old style of cheese, originally developed by British farm wives who saved the curds from several days of milking and combined them to form a single wheel. Since the curds ripen at different speeds, a unique taste forms. Think of it like pot pourri – lots of bits, assembled to form one lovely scent. In the ‘40s, production of Lancashire dwindled, and now there is just one maker who still produces traditional Lancashire. That maker is Mrs. Kirkham – well, her sons run the business at this point, but their cheese is named in honor of their mother, Ruth. One other factor adds to the glory of this cheese. Once wheels are formed, the rinds are smeared with butter. Perhaps this is why Mrs. Kirkham’s Tasty Lancashire reminded our party of muffins. It’s hardly a cheese at all, more like a pound cake – perfect for a Charlotte. Note: The U.K.'s Daily Mail just published a list of 8 under-the-radar British cheeses. Worth a glance and a sniffle. I see Lord of the Hundreds listed, a sheepy devil I tried at the Fancy Food Show but never see on shelves. One can only mewl. One of my favorite essays is Joan Didion’s “In Bed.” If I were going to write about a place where I spend most of my time, it would be called “At The Desk.” Until about a month ago, I wrote most of my posts at the kitchen table, but now that my cheese life keeps expanding, I finally had to create room for it. So, welcome. Today, I thought I'd offer you a tour of my cheddar-colored inner sanctum. Here's what it looks like. To me, a writer’s work space requires certain essentials: good light, a project board, plants, books, drawings, a place to recline, gentle clutter, and, well, personality. I’m always surprised when I visit other people’s home offices that are tidy as a tack. Maybe I’m weird, but I like to trick myself into thinking that I’m part of a Bedouin encampment. If I think about how isolating my life is – all this pecking at the keys, so many afternoons photographing cheese – I can get spooked. My work space offers space for cheese reverie, complete with books in the corner, but it also serves as a crash pad for visitors. Fromage + functionality. The best thing about this room is the project board I put together to keep my notes in plain view. Until recently, I used a filing cabinet, but I discovered that filing cabinets eat things. I could never find anything I was looking for. A filing board? Oh mercy, it's my new miracle. This is where I tack tasting notes, dote on other people's beautiful business cards, keep lists of things to do, track freelance contracts, mull over secret plans, and sometimes rearrange sticky notes to create a sense of having accomplished something. Other times, I simply try to read my own hand writing as a form of mental exercise. In a few months, I'm planning to redesign this site -- that's right, Blogger has served me well, but now it's time to dream of new url's. Creating a physical space, a Cheese Command Center, if you will, was the first step in a new screen vision. I hope you'll stay with me as the process unfolds. And if you've got any notes to share, from your desk to mine, I hope you will. Garrotxa (guh-ROACH-uh) is distinguished by a fine layer of gray-brown surface mold that looks like woven cloth. It smells -- dare I say this? -- like a stuffed animal that was propped under the cheek of a sleeping child. Imagine acorns, soft bedding, sweet milk. To continue reading, click here. All summer, our kitchen windowsill has been polka dot city. That’s because we had a few rogue cherry tomato plants appear in our yard after we’d already put in plants at our community garden. So, it’s been the summer of little bursts, of teeny weeny suns. I’ll miss them. They brighten the kitchen and are so easy to toss into salads, omelets, pasta and salsas. 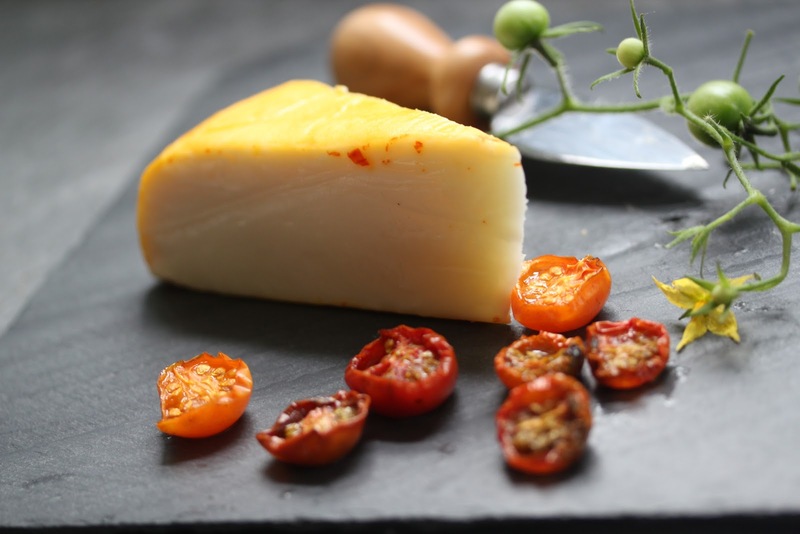 With the right cheese, preferably fresh mozzarella or Bulgarian feta, they become the day’s delicacy. To preserve the last baubles for weeks to come, I decided to oven-roast the last haul. A couple years ago, I tried this with Romas. Exquisite. This year, I was curious to try oven-roasted cherries. A combination of Sun Golds and Black Cherries. If you have late-summer cherry tomatoes, this is a quick, easy recipe you can make ahead and keep in the fridge for at least a week. 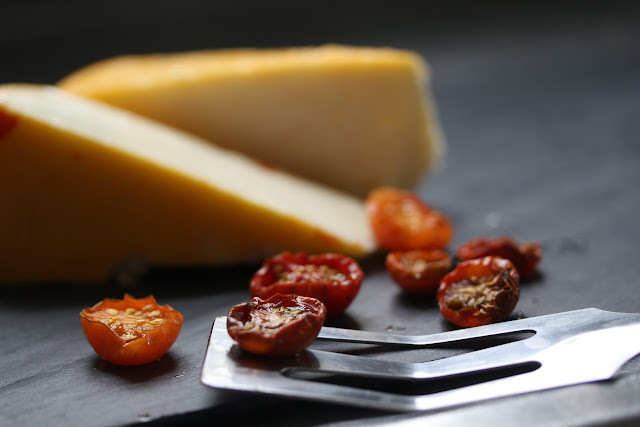 Oven-baked cherry tomatoes can be tossed into linguini or served on a cheese plate with cheddar or Port Salue. 1. Halve cherry tomatoes and toss them in olive oil. 3. 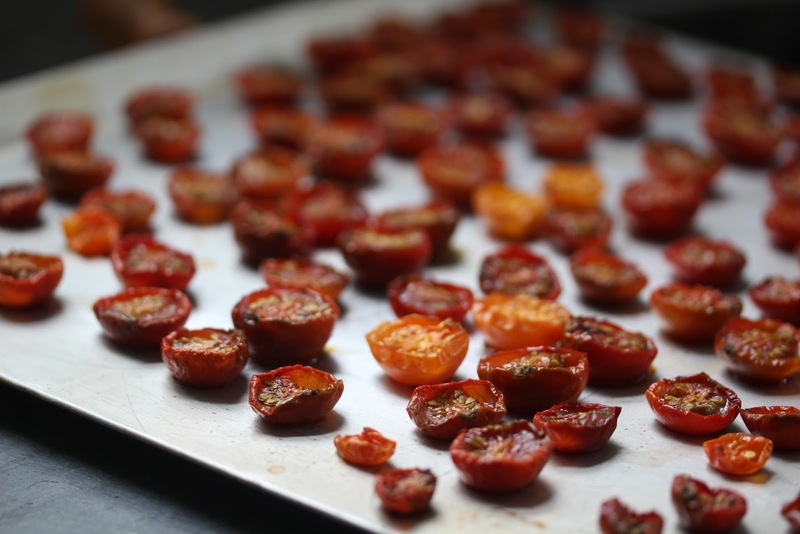 Arrange the tomatoes on a cookie sheets, cut-side up. Use parchment paper if you don’t want polka dot accents on your sheets. 4. 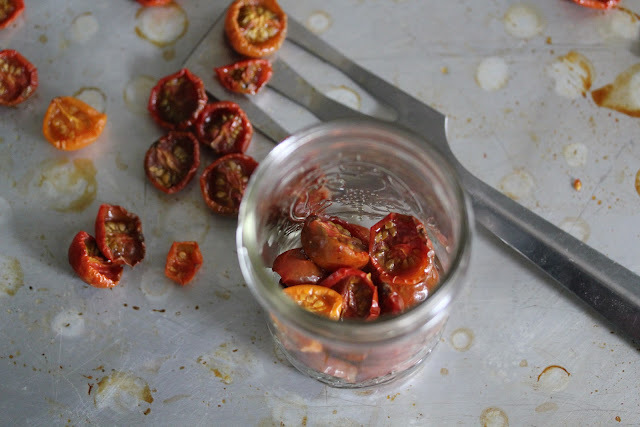 Bake tomatoes about 2 hours or until they are soft, juicy and a shriveled. 5. Sprinkle with sea salt and cool. Refrigerated, these keep for about a week. This week, Serious Eats put out a list of 13 Cheeses Everyone Should Know. When I saw the link appear on Twitter, I had to click and peruse. At first, the list seemed a little basic – feta, mozzarella, Monterey jack – but then I thought back to a convo I had recently with my writer-friend Sam. He told me he didn’t think he could name ten cheeses. My jaw dropped. Sometimes I forget that I live on a cheese-centric planet and that not everyone orbits this little star. So, I decided to create my own cheese list – 13 Cheeses Everyone Should Try. I don’t care if you're a complete novice or an intrepid aficionado. If you try even one of these cheeses, you will see the world differently. Your tastebuds will jump several I.Q. points. Your heart will open and a joyful cuckoo will fly out. Why? These cheeses will show you how good cheese can be, and I think they have universal appeal. I've served all of these to finicky nervous types, and I promise that these wedges will not alienate you. Next time you need to feel revitalized, don’t buy eye cream. Buy good cheese. 1. 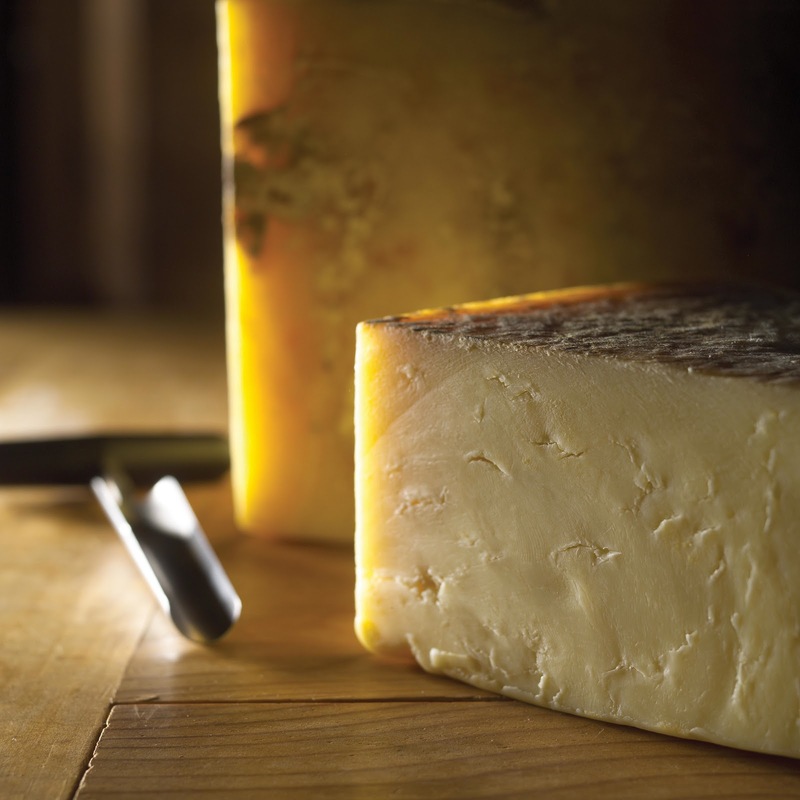 Cabot Clothbound Cheddar: Made in Vermont, this is the one cheese that never fails to make Americans rethink block cheddar. 2. Midnight Moon: You don’t need a nightcap, you just need a nibble of this firm goat cheese that tastes like candy corns. 3. Rogue River Blue: Right, I know you don’t think you like blue. Eat this anyway. 4. Delice de Bourgogne: A float-away triple crème. No holiday home should be without it. 5. Nevat: Sheep’s milk snow from Cataluna, Spain. Etherial and unforgettable. 6. Truffle Tremor: Need I describe? 7. Parmigiano Reggiano: Get the real stuff and drizzle honey on it. If you can find Cravero brand, you’ll fall backwards. 8. Winnimere: Like gooey fondue, but wrapped in bark. Hard to find but worth begging for. 9. Montchevre Cabrie: Trust me. Goat Brie from Wisconsin. When ripe, it’s better than fudge. 11. Strathdon Blue: Imagine the Atlantic Ocean in cheese form. 12. Pleasant Ridge Reserve: An American original with an incredible array of flavors. 13. Evalon: A new beauty with a wild number of awards. Think: ungoaty Gouda. All of these cheeses can be ordered online. I'm partial to Di Bruno Bros. in Philadelphia, but I also recommend ordering from Murray's, Artisanal, and Formaggio Kitchen. You can also buy some of these cheeses directly from the cheesemakers via their websites. If you find one you like, let me know. If I've led you astray, shoot me a dirty look. If I missed one of your faves, for goodness sake, tell me this instant. This week I’m gearing up for a special moment – I’m hosting an interactive cheese tasting as part of TEDxSJU, an event that takes place this Thursday on the campus of Saint Joseph’s University in Philadelphia. You’re probably familiar with TED – it’s a series of livestreamed talks by speakers and thinkers from all over the world. I’ve watched many TED talks (I'm riveted by Paul Stamets' mushroom talk), but I’ve never seen anyone host a TED tasting. That’s why I’m presenting CHEDD-X, a talk about cheese and social media, accompanied by a tasting of traditional British cheddar for 150+ students. Why? Well, here in Philadelphia, most students think of cheddar cheese as the Whiz that goes on cheesesteaks. I want them to experience what cheddar tasted like in its earliest incarnation – the cheddar of their ancestors. Mary Quicke produces a traditional English cheddar that I happen to love, and she is a social media phenom. 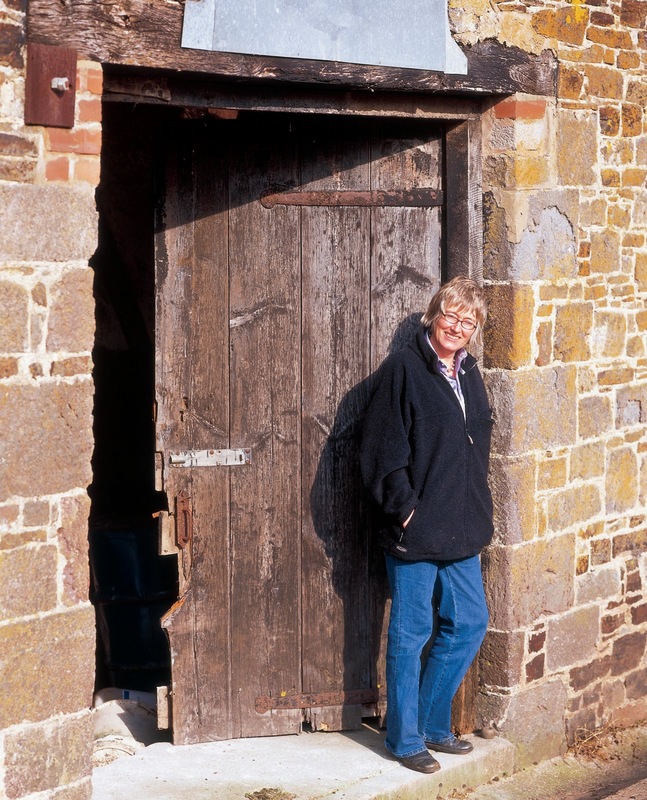 She writes a fantastic blog, Mary’s Diary, where she provides monthly updates about her farm in Devon -- from the changing crops in her fields to new calves in the barn. Just had a beautiful puffball left outside my door by Graham – yum. Lovely braised in butter, + a hint of our smoked cheddar + parsley. Mary is an example of someone who defies social media stereotypes. She’s not a twentysomething (sorry, Mary) and she doesn’t work for a marketing company as a “strategist.” She works for herself, and through social media she offers us a glimpse into her extraordinary passion for cheesemaking. TED talks are about ideas worth spreading, and while I hate to overwork the obvious pun, I have to tell you that I think Mary’s approach to social media is worth spreading. She’s not simply promoting cheese or her dairy; she shares her story. In fact, Mary doesn’t ostensibly “promote” at all. She doesn’t offer coupons or gimmicks. She doesn’t push her product. 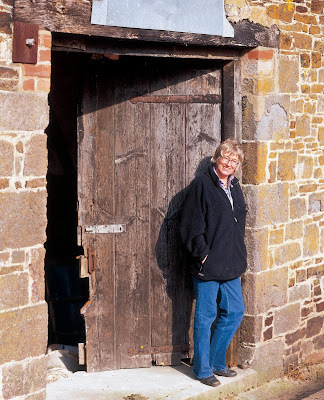 She uses words and images to bring us into her world so that we can’t help but yearn for a nibble of cheese, a whiff of cavey rind. Mary speaks to our senses. When she shares details, people want to listen, look, taste, inhale. That, to me, is what sets Mary apart. She’s the Basho of the Twitterverse, the Brontë of the blogosphere. Who wouldn't want to follow her? 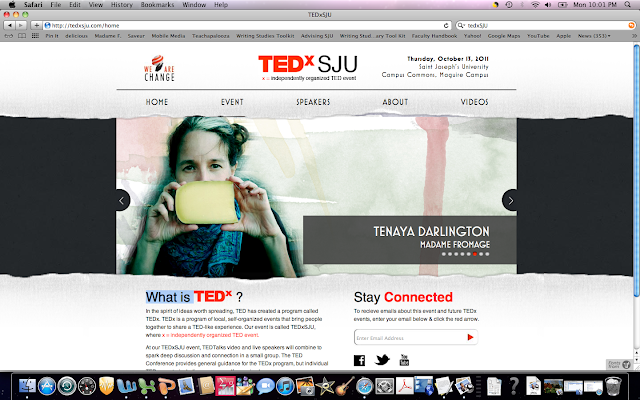 TEDxSJU takes place on Thursday, Oct. 13 from 4-7 p.m. in the Creative Commons at Saint Joseph's University. The public is welcome to attend. Some people get excited about shoes, I get excited about cheese that smells like shoes. Don’t ask me how this started – my mother tells me that I loved to crawl as a baby and refused to walk until I was more than two. Maybe during those formative years I developed a nose for scrunge. Needless to say, I got very excited in Di Bruno Bros. this week when I learned that the cheesemongers had just received a shipment of new whiffies from Neal’s Yard Dairy in London. Neal’s Yard is to milk what Milan is to Italian leather. Their cheeses are just as sumptuous. And just as expensive. So, here’s what I did: I closed my eyes, opened my billfold, and bought three num-nums. Then I picked up a good loaf of bread, plucked the last of the Sungold tomatoes from the vines in the yard, and had myself a stinky cheese fest and photo shoot. The boyfriend was out of town. He wouldn’t have liked this fete. Not at all. I didn’t care. I wanted the stink to myself. And because one of these stinkers cost $49.99/lb, I was happy not to share it. Not with anyone but you. This raw goat from Somerset looks like a toad stool, a very fall-appropriate lump. Its jacket is stunning, a thick bunting of Geotrichum – the same mold you find on Brie. Underneath, there is a gorgeous cream line and a center of nougat. This little package is slightly tangy, a twinge peppery, but mostly it's just beautifully balanced citrine softness. I want an ottoman made of Stawley for my tired Friday feet. 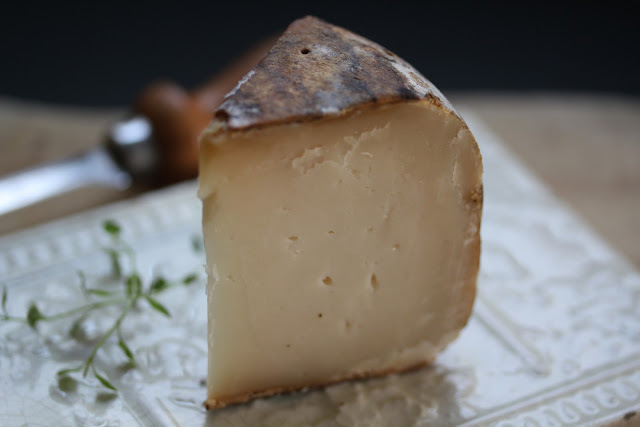 Next up, a washed rind goat's milk cheese made with thistle rennet as a coagulant – who knew? What a stunning gesture. Thistle rennet imbues cheese with a vaguely artichoke-like taste that I happen to love. If you like La Serena, a gooey Spanish cheese also made with thistle rennet, you'll want to seek out this wicked sliver. Cardo, a fudgy, faintly gritty cheese, reminded me of sirloin – very beefy. It’s the blood pudding of cheese. Curiously, it smells like baby feet, which is to say, very sweet. “This cheese reminds me of dead flesh, but in a good way,” Di Bruno Bros. cheesemonger Zeke Ferguson told me as I was trying Saint James in the shop. I like Zeke, but should I trust him? Saint James smells like barn boots but tastes like warm grass, cooked mushrooms, and scrambled eggs. It’s made from sheep’s milk, so it’s a creamy thug, full-flavored and tongue-coatingly rich. For such a big cheese, it has a purr of a finish. I could have eaten a loaf, despite the gritty rind – a common trait in cheeses that are brined. Note: I'm told that Di Bruno Bros. is testing these British babies out on the American market. Maybe we can start a minor squall if enough people ask for them. They are quite unique, and together, these three stooges make a splendid cheese plate for the discriminating Anglophile. For my Di Bruno Bros. column this week, I write about Cabot Clothbound Cheddar, a beautiful mummy of a cheese from Vermont. It's bandaged in cloth and "larded," then cave-aged -- like an Egyptian pharaoh. Whenever I eat clothbound cheddar, my mind flashes to the mummified cats on display at the Penn Museum. Sorry, that's a bit ghoulish, but I do find it fascinating that cheesemakers adopted this method of preservation to create wildly flavorful cheeses. This one smells like the woods and tastes like a thousand things. 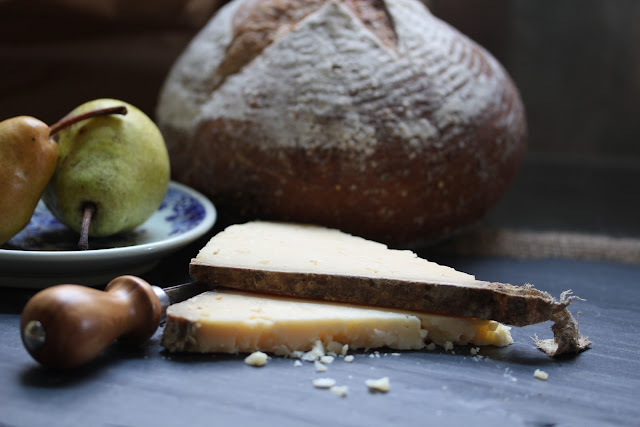 If you want to read about it and try a little clothbound cheddar tasting (highly advised around Halloween), you'll find all the info over on the Di Bruno Blog, where I post twice a month to earn my cheese allowance. If you're a cheddar head with lofty aspirations of understanding this tricksy style of cheesemaking, check out The Cheese Chronicles, by Liz Thorpe. She writes beautifully and thoughtfully about cheddar in her chapter on "The Amish: Seeking the Roots of American Cheese" (pp. 90-123). I reread it over a nibble of Cabot Clothbound, and as always I fell under Thorpe's spell. She talks about cheddar the way some people talk about craft beer -- with reverence, pop, and understanding. If you want more juicy backstory about Cabot Creamery and how Vermont became a cheese mecca, listen to Ann Saxelby's interview with Paul Kindstedt on "Cutting the Curd," a Brooklyn radio show all about cheese. Kinstedt has trained many American cheesemakers and is a sort of Gandalf figure in the American farmstead cheese movement. His take on the Vermont cheese scene is fascinating, and you'll enjoy Ann Saxelby's gently probing Midwestern twang. After a few rolls of the dice, we have some winners for the four cheese journals I put up on Friday. The following cheese fiends should email me (see below) in order to receive their prizes by mail: Miss Platt, Kit, Brian Kall, and Goat Song. Cheers and happy cheesing, everyone. Special thanks to Dave Selden for providing free samples from 33beers.com. And many thanks to all of you for coming out of your quiet corners of the universe to leave a comment.